Apologies in advance if I get some of this out of order — Kj and I had a wild two days together in Edinburgh that included 4-5 pubs and 7 shows, with other attractions tucked in here and there. It was great! We got up at a sane hour and went to pick up my “Arts Industry Professional” pass from the festival office, which was pretty awesome but conferred, as far as we could discover, no real benefits other than some street cred and once I was mistaken for another Arts Professional and I guess that’s cool. But still. TOTALLY LEGIT, YO! We were eventually beckoned into an antechamber with a legit abattoir by a masked figure, where we filed in awkwardly and watched ten minutes or so of dance with weird mutant organic costuming, then were beckoned into the main chamber. THE MAIN CHAMBER OF THE AUTOPSY DEMONSTRATION ROOM. It was rad. The audience was seated in high semi-circular wooden pew-like benches with the back of the pew in front of you serving as a shallow desk for note-taking. Our feet didn’t reach the floor. It was uncomfortable, but brilliantly so. We proceeded to watch 40 minutes or so of a post-apocalyptic dance investigation of the cycle of human violence, and it was VERY good. Then we were beckoned back into the antechamber, where we stood on raised rows and watched a mad scientist-type do a grotesque autopsy on another character. Kj viewed it (correctly, I believe) as the completion of an experiment on violence — the scientist dissecting his still-living subject to see what had happened to it. I, perhaps perversely, also saw a sort of Frankenstein/Pygmalion aspect, and had moments of wondering if he were trying to resurrect his damaged creature… but I tend to look for the positive side of things. Anyway, it was a really good show. Then we decided to return later in the evening for a second show in the same venue, this time a multimedia puppet show entitled Feral by a company whose name escapes me at the moment. 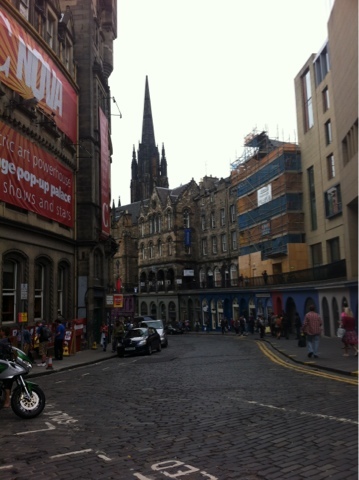 We wandered about a bit in between, I think we visited St Giles Cathedral at that point, which was great. I especially liked the way all the seating faces the center of the cross, rather than the altar, which I think is meant to show that the Word is central to that particular belief system? We also visited a bar where we played a game of Scrabble (she trounced me) and I had my first glass of Islay whisky after sampling a taste the previous night (more on that later). At some point we also visited the museum (I think maybe the National Museum of Scotland or something), which was in this amazing Victorian building and totally great. It was arranged in sort of a cabinet-of-curiosities style, which worked really well for the time period and made it really fun to explore. Anyway, then we saw Feral. It was stunningly constructed. Absolutely lovely. A team of four puppeteers, a video artist, and a sound artist (some Foley stuff, yay!) created this incredibly detailed world… they built it before our eyes, all out of paper, lit it expertly, and then filmed it live with two mini cameras which were projected on a screen above and mixed live by the video artist to create this seamless live film, but you could also watch everything happening below, including all the setup for the subsequent shot. It was beautifully, beautifully done. The story left a bit to be desired, which is a common issue I have with puppetry — I just find that, naturally, the best puppeteers aren’t necessarily playwrights, and could really benefit from working with one, or with a dramaturg, as they have a tendency (again, naturally) to get caught up in these incredible worlds they’ve created and show us excerpts from life there, without always forming it into a story that an outsider to the world will especially care about. Sometimes (and I realize this might seem offensive but I don’t mean it that way) it’s a bit like being taken by the hand by a small child and introduced, in great detail, to each one of their dolls. “This is Joey, he’s afraid of the dark so he has to sleep on my pillow, but Jill here gets jealous because then she has to sleep in the toy bin…” Anyway, story aside, it was brilliantly done and I would absolutely love to see more of their work. Then we went to procure tickets to the last show of the night — I had walked by a poster earlier proclaiming that The Tiger Lilies were performing at the Fringe, so of course I had to go. We first had some food at a pie shop (meat pies, yum! I had a haggis pie with mashed potatoes — it was my first introduction to haggis and I found it to be delicious). Then we went to a pub called Library Bar, which was quite nice, and had a drink. Then we went to see The Tiger Lilies. As mentioned earlier, today Kj introduced me to Islay whisky (‘Scotch’). I really dislike whisky and bourbon and brown liquor in general, so I expected to hate it… but, um, it’s AMAZING. It tastes like woodsmoke and campfires and the night on a Scottish moor and history and old leather and magical wardrobes that lead to impossible lands. It’s definitely a thing to take tiny tiny sips of, but the flavour is really quite wonderful. Yay tiger lillies! Sorry to hear they weren't as good. Did they sing kick a baby down the stairs? sidenote: I didn't think I was all that interested in visiting Scotland, but you've made it out to be quite magical and endearing.